3. Sheath: Natural rubber, Horoprene rubber or other syntheitic rubber,PVC or or CSP. 4. No.Cross-section: 10mm2, 16mm2, 25mm2, 35mm2, 50mm2, 70mm2, 95mm2, 120m2, 150mm2, 185mm2 , 240mm2. 6. Color: Choice of Black, Orange, Red or Yellow Blue jacket, single & double insulated. 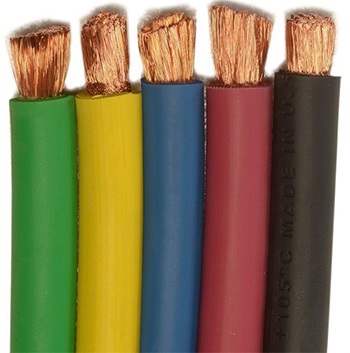 Where can buy quality discount 8 gauge welding cable? How much do you know about shielding layer of 8 gauge welding cable? What’s common problem and reason of 8 gauge welding cable? Our advantages: Huadong Cable Group is one of the most high-quality cable manufacturers and suppliers in China. Our cable for sale absolutely is superior. We can manufacturer quality and cheap cable. So for the quality of cable, you can be assured of it. You can send us an e-mail or call at any time. Customer Case: We have exported wires and cables to more than 30 countries, such as: Russian, America, Yemen, South America, North America, Middle East, Africa, Asia, Oceania countries, etc. Please leave your requirement, we will reply you within 12 hours. Office: Nanpu international center, Jinshui district, Zhengzhou City, Henan P.R. China.